Brewed 06/19/15. My neighbor and friend Phil had been wanting to split a batch with me for a while, and the plan was originally to do an Oktoberfest. Unfortunately I didn’t have time to get to my usual LHBS, and the smaller one near my work was low on yeast, so I couldn’t get enough to do a lager. 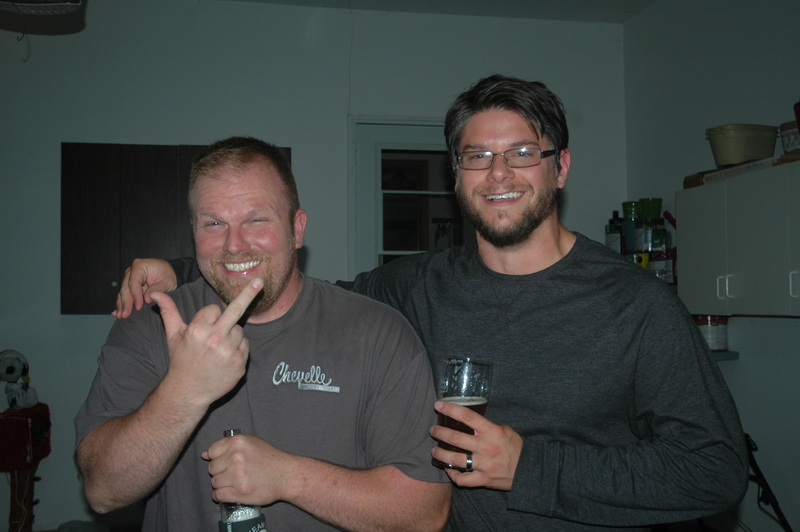 Phil is a Miller Lite kind of guy, but he loved my Oktoberfest and other craft lagers I’ve given him. Since I couldn’t do a lager, I decided on a cream ale. Cream ale is a great entry into the craft beer world. They are light colored, easy drinking, mild, refreshing, and with just a bit more flavor than your typical BMC beer. 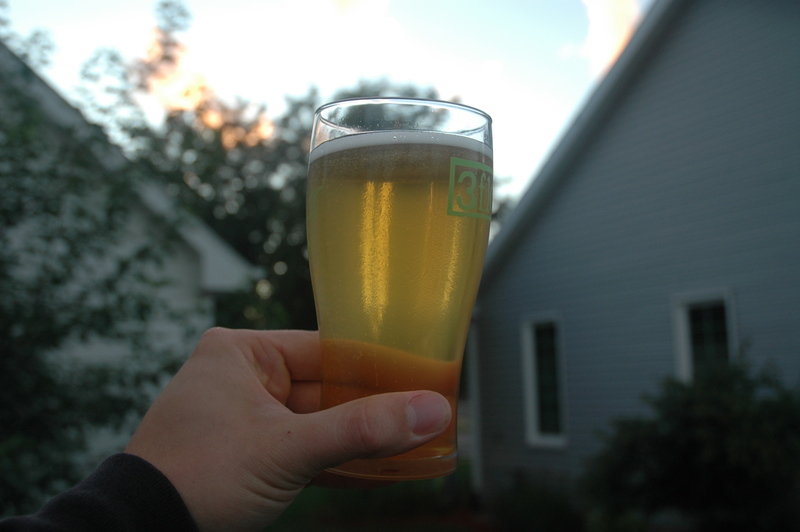 The beer should finish relatively dry to maintain a crisp finish. When you hear the term “lawnmower” beer, cream ales are a style that comes to mind. Hop and malt flavors should both be relatively light in a Cream Ale, though there’s some room for interpretation. These are basically light lagers with ale yeast, so I figured this would be a great summertime beer to split with Phil. I don’t drink a ton of cream ale, but there is one that I really enjoy: New Glarus Spotted Cow. They call it a farmhouse ale, but if we’re labeling things here then it’s basically a cream ale. Its a nice light beer that appeals to the BMC crowd, but it still has some really great flavor. I looked at some recipes on Homebrew Talk and I got some ideas there. Northern Brewer also released a clone recipe called Speckled Heifer. As usual, I’m not particularly interested in cloning a commercial beer, Spotted Cow included, but its a great starting point for my recipe. The grain bill for this beer was pretty light. Its just 2 Row, Carapils, Flaked Barley, and Flaked Corn. The carapils will add some body and head retention, so will the flaked barely. The corn will impart some fermentable sugars without much flavor or color contribution. These are the ingredients found in Spotted Cow apparently, though I’m not sure what the grist percentages are. The hops in Spotted Cow are allegedly Cluster hops, and these seem like they should do nice in a Cream Ale. They should have some spice and floral qualities and are frequently used in American Pilsners. I went just a bit heavier on flavor and aroma additions than is probably typical for the style, but I needed to spice things up just a bit. I debated between using Wyeast Cream Ale or Wyeast Kolsch. Yeasts for a cream ale should obviously be top fermenting, but a combination of ale and lager yeast can be used, and that is apparently what Wyeast Cream ale blend is. Spotted Cow reportedly uses Kolsch yeast, so I leaned towards that. Kolsch yeast has very lager-like qualities. Once properly conditioned, Kolsch yeast will produce a very clean, crisp beer that bears a strong resemblance to a lager. This can be further aided with extended cold conditioning. All in all, this beer should be very crisp and refreshing with some nice flavor. The Freedom Hawk name is joke between Phil and I with our wives. Since I’m splitting this with my neighbor, I figured this would be a fun name for the beer. 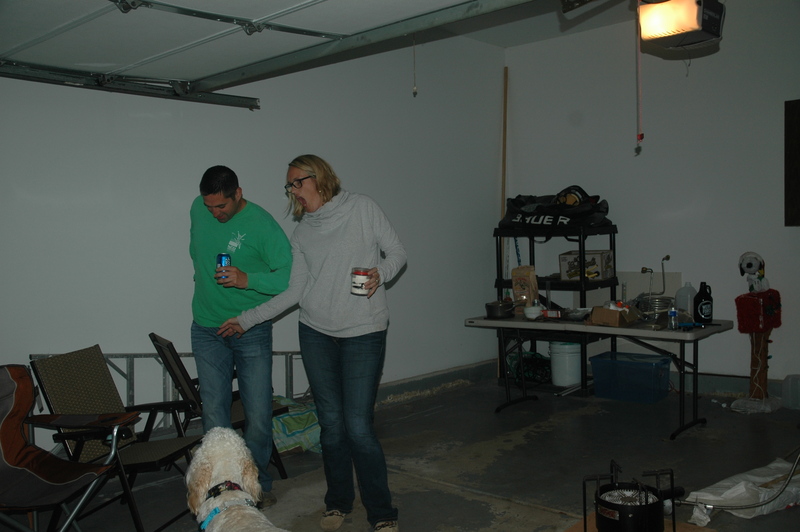 This was a Friday night brew night. I got home from work, Phil and I went to the LHBS, and got brewing around 8. The other neighbors came over and my wife got home from work. We wrapped up around 2 am. 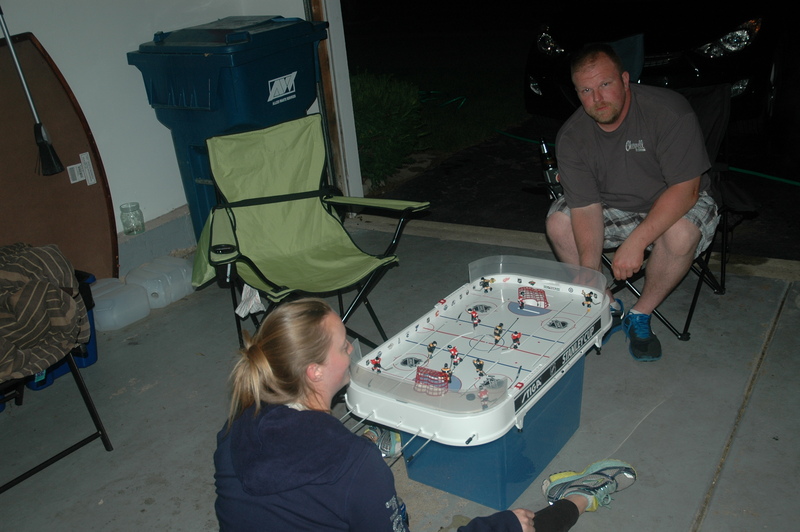 In between was a whole lot of beer, pizza, dancing, and a bit of table hockey. I was on my game despite all the fun stuff around me, and I hit my mash temp and my OG of 1.045 on the dot. It was nice not having to work with a ton of ingredients in this beer, and especially nice not having to filter a ton of hop matter before going into the fermenter! I plan on fermenting beer for two weeks at 58 degrees, raising to ambient temps for a couple days, and then cold crashing and fining with gelatin. This will then go in the bottles to carb for a couple weeks, then in the fridge for some cold conditioning. I’m thinking this will be great by August after its cold conditioned, but I’m sure I’ll have a few by then. Update: I bottled half of this batch for Phil and kegged my half over the weekend. The beer dried out a bit more than intended, but that’s ok. The FG came in at 1.007, giving me an abv of 4.9%. Thats still pretty crushable and perfectly in line for a cream ale. Still, on my session style beers, I seem to undershoot my fg pretty often. I may need to start subbing a bit of carapils in most of my recipes for base malt! I had a sample last night after this had been in the keg for a few days. It already tasted really nice, but was still hazy as hell. I fined this beer with gelatin when it went into he keg since I’d like this style to be clear, but I know Kolsch yeast can take a while to flocc out. I’ll do some tasting notes after this one’s had a bit to cold condition in the keg. Appearance: This beer pours straw colored. The beer is pretty clear, with just the slightest haze. The beer has a persistent head and some nice lacing. Smell: Freedom Hawk has a pleasant bready yeast aroma that is very reminiscent of a lager. There’s also just a hint of floral and spice notes from the Cluster hops. A very mild aroma to this one. Taste: A mild easy drinking beer for sure. There’s an easy bitterness upfront that quickly gives way to a light grainy malt flavor. There’s a very light and faint fruit flavor, but its very mild. The Kolsch yeast leaves a very clean lager like profile. Mouthfeel: This beer is dry, but there’s a nice bit of body to keep it from feeling thin. I’d like to have this one a bit more carbonated, but I don’t have the equipment to keep my kegs at different PSI. The beer has a very crisp lager like quality, and it would be easy to chug this one! Overall: This beer certainly isn’t reinventing the wheel, but its a very good example of the cream ale style. I probably could have lagered it longer for better clarity, but its drinking fine as is, and should continue to improve until the end of the keg. I’m really satisfied with this one and there’s nothing I’d really change, maybe just lowering the abv a bit. This beer also satisfied my lager loving friend Phil so I consider it a success! This isn’t a style I drink much of so I’m not sure when it’ll be back, but next time I need a Cream Ale, I’d gladly come back to this one! I see you use acid malt in a lot of your recipes. It looks to me you are starting with RO water, and building up from there. I have started doing the same thing, with four batches of built-up water under my belt while the fifth one will take place this weekend. Anyway, I used acid malt on my latest pilsner (though I am calling it a SMASH since I used only a little to help the pH -shhhhh), and it is the only time I have used it. So I am simply wondering why the acid malt? I believe that your pH would have been just on the high edge of 5.6 given your grain bill. Does the amount you use impart flavor, mouth feel or in this case help “crisp” the beer by lowering the pH? This is in no way a criticism. I truly am curious. 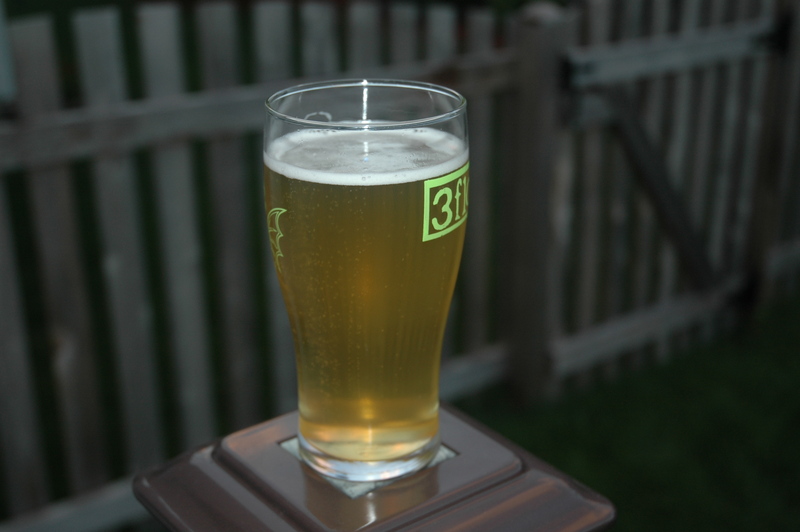 I am finding the beers I have made with RO and added minerals are better than before, but have a thin mouth feel. Could it be because I lack acid malt? I have no pH reader, but the estimates from the calculators are all within the acceptable range. The only exception was the pilsner, which I deliberately wanted low and hence the acid malt. On a side note, the next beer I am doing will be an APA using Golden Promise, flaked barley, and carapils too -super similar to your grist here. I was contemplating a half pound of oats, and now…. a few ounces of acid malt? Keep up the good work here. Our “breweries” ought to get together and do a collaboration. That would be funny. The acid malt in my recipes is only used to keep my ph in the range I want it. In the amounts I’m using it you shouldn’t detect it in the taste. Based on what I’ve read, lowering the ph in hoppy beers can help the hops pop a little bit more. I usually shoot for around 5.2 in my IPAs. I don’t have a ph meter though, so I’m just going by what the calculators tell me! I know ph can also have an impact on mouthfeel and even color, but I’m still learning the ins and outs of it. In the non hoppy beers like this cream ale, I believe the beer will be a little crisper with the ph a bit lower. If I recall correctly, I was shooting for around 5.4 with this beer. For mouthfeel, I’ve been adding some white wheat and oats to a lot of my recipes. That’s helped round the mouthfeel of my beers out quite a bit. I’ve also begun going with a higher chloride amount, even in my hoppy ales. Chloride can help add some fullness to the body of the beer. I haven’t noticed the higher chloride to sulfate ratio diminishing any of the hop flavor. Yeast can make a big difference on mouthfeel too. As for your APA, that grist sounds awesome! I say go for the oats, I love what they add to the body! I love Golden Promise malt too, its one of my go to base malts. I really like the bready/crackery sweetness that it imparts. You can get some great flavor with it without having to use a bunch of specialty grains. A collaboration would be a lot of fun! Hey Eric, thanks for the quick response… I too have been using homebrewtalk and decided on this beer to make the cl/so4 ratio more like 1:1. My additional grains (carapils, flaked barley and oats) on this will be roughly 13%. No crystal… No dextrose… Just the Golden Promise. I will hop the dog crap out of it, all late hops. I don’t like using a ton of different hops, I like the complexity of a dank hop coupled with a citrus forward hop. I feel the dankness anchors the citrus. I am also trying to get away from the west coast yeasts as I feel the dry out the mouth too much. I have heard good things about Denny’s favorite so that will be used this time, too. I am striving for the body/hoppiness of AntiHero. Any way, I will check the ph level with the calculators and add as needed. I have not completed many batches where I log my pH so I don’t know if my preference is on the high end of 5, or the low end. I guess I will have a better idea in 5-6 weeks! Sounds like you’re going to have an awesome pale ale! I would think body on the beer shouldn’t be a problem with what you’ve got going on. Good call on a simpler hop bill. That’s one thing I still need to reel myself in on. There’s so many awesome hops out there and it gets tempting to want to use a bunch in every recipe, but then none of them shine. I had to force myself to cut the type of hops in my main DIPA from 6 to 4, and even that was hard! I like the fruity/dank combo of hops too, I tend to shy away from the more floral ones in my hoppy beers. I agree about getting away from west coast yeast, I don’t use it much anymore. I’ve never tried the Denny’s Favorite, but I’ve heard really good things, and it sounds like it would go well with what you’re trying to achieve. I’ll be interested to hear what you think about it! 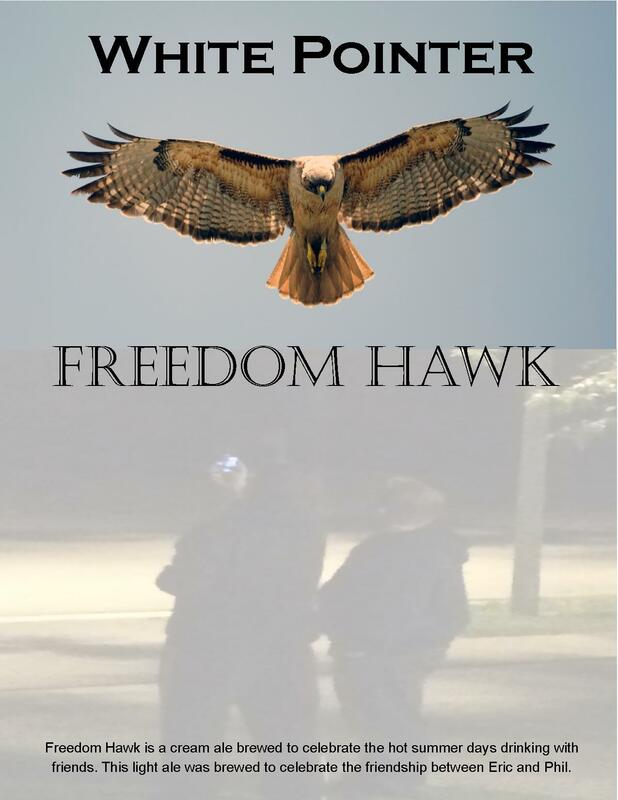 Freedom Hawk is also a heavy rock band from VA Beach,VA that loves to drink beer! Here’s a link to there Bandcamp site. freedomhawk.bandcamp.com It’s great music to drink beer.